When granulating on tubes, use gravity to your advantage. 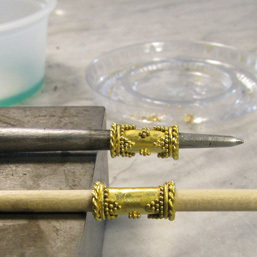 Place the tubes onto dowels or mandrels so that they fit tightly. Glue granules only on the section of the tube that is facing up—about one third of the tube. You may have to use something to stabilize the dowel so that it doesn’t roll around. Allow the glue to dry and then fuse in the beehive kiln. Posted in Granulation. Bookmark the permalink.